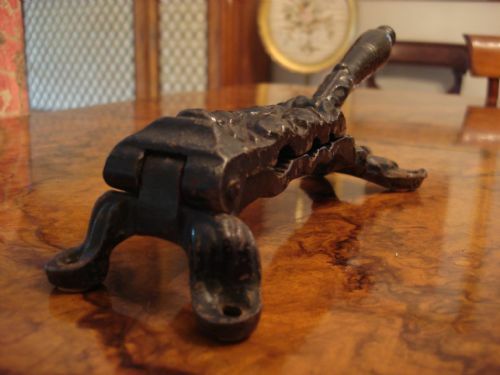 Late Victorian cast iron cork press or mould for apothecary or chemist use, from a private collection. From the private collection of a retired pharmacist, a Victorian period hinged cast iron cork press with handle, in a leafy design with three different sized moulds. A pharmacist or chemist would wet a cork and press it to size within this mould to be inserted into different sized bottles of custom mixed medications. As the cork dried, it stoppered the bottles tightly and securely. 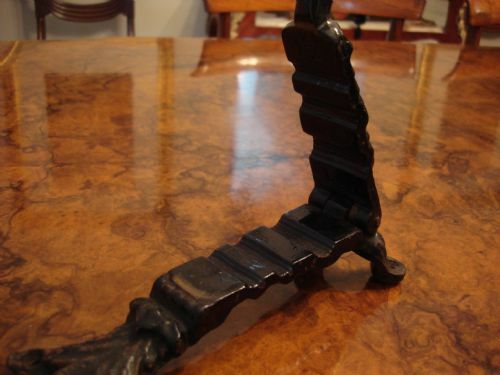 The press was meant to be secured to the table for use, through the four holes on the feet. 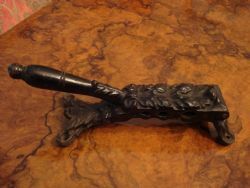 Size-9.75 inches long by 2.75 inches wide by 3.25 inches high at highest point. 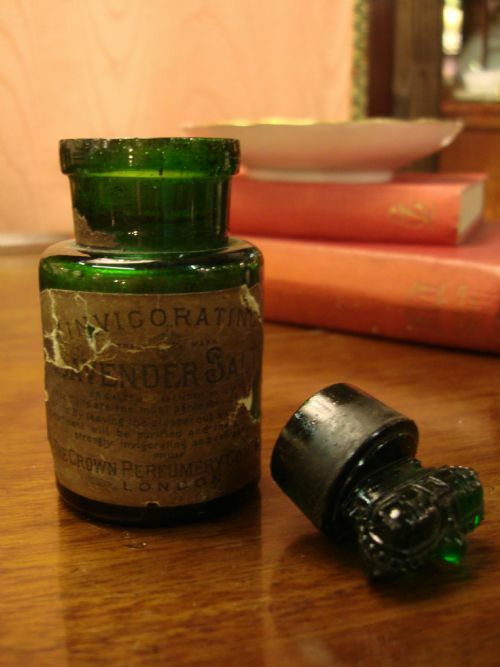 Still retaining the original finish, this interesting apothecary antique is in very good condition. It would be an asset to a collection, and an excellent talking point. This item will ship from the USA. 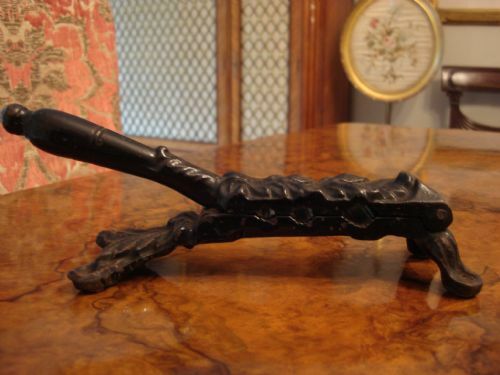 19th century bronze mortar and pestle. 19th century heavy bronze mortar and pestle formerly used in the apothecary trade to grind pharmaceuticals into powders. Now used for grinding spices and for decorative purposes. Lovely patina to pestle from handling. 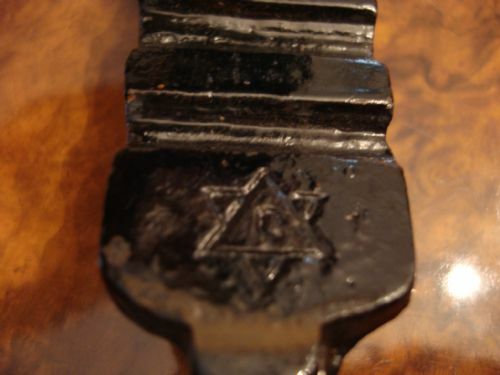 Size-mortar approximately 4 inches high by 4.25 inches diameter at top and 2.5 inches at base. Pestle is 7 inches long and sits 3.25 inches above mortar when standing inside. A great decorative piece, or to add to a collection. 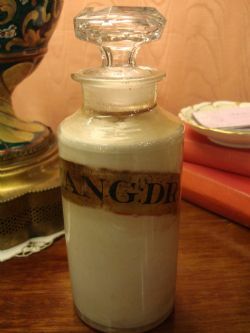 Large 19th century apothecary jar with painted label. Large 19th century apothecary or chemist jar with very nice gilt and black painted label and some original contents, from the large private collection of a retired pharmacist. The collection includes many bottles, laboratory glasses, potions and pastes, an iron cork press or mould, glass cabinet labels, measures and other items. 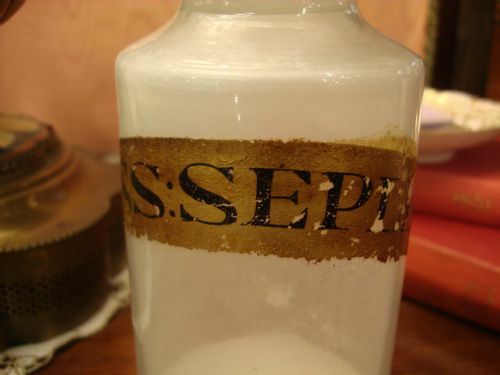 This bottle label is labelled OSS: SEPIAE and includes a small amount of the powdered contents. It is dried cuttle fish bone or shell and was used as a tooth powder, and to stop bleeding arrest seminal discharge or leukorrhea, to inhibit gastric secretion, and to promote the healing of wounds. The stopper is a lovely cut glass facetted example. Size-8.25 inches tall by 3 inches diameter. A very nice apothecary bottle for collection or display, in very good condition. The last photo shows more of the other bottles in the collection, if more are desired. But this listing is for the one bottle. 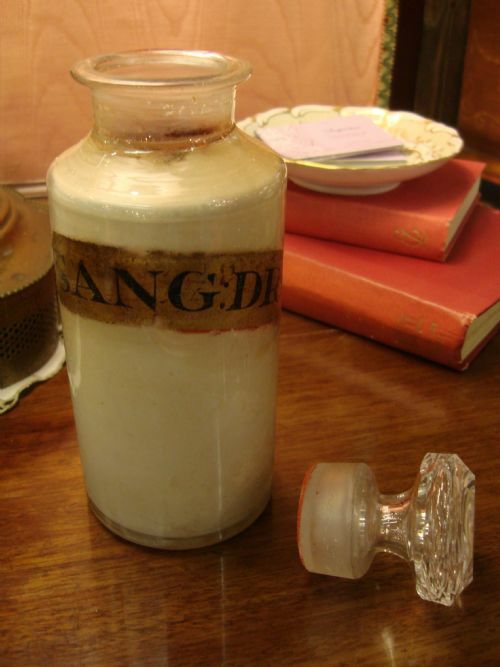 Large 19th century apothecary or chemist jar with a gilt and black painted label and some original contents, from the large private collection of a retired pharmacist. 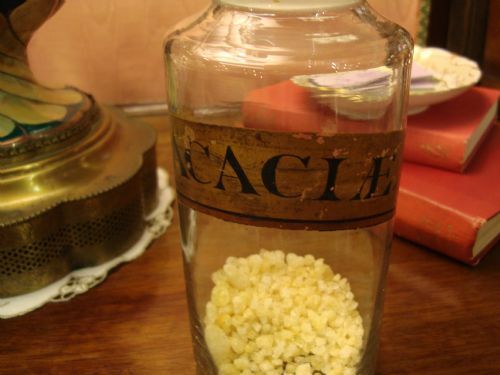 The collection includes many bottles, laboratory glasses, potions and pastes, an iron cork press or mould, glass cabinet labels, measures and other items. 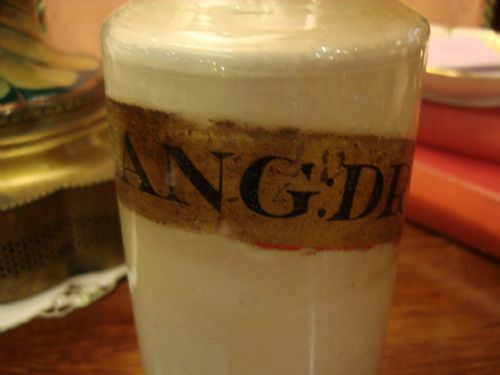 This bottle label is labelled P: SANG: DR and includes some of the red powdered contents. It is powdered blood root, and is an irritant, expectorant and nauseant, and a dye. 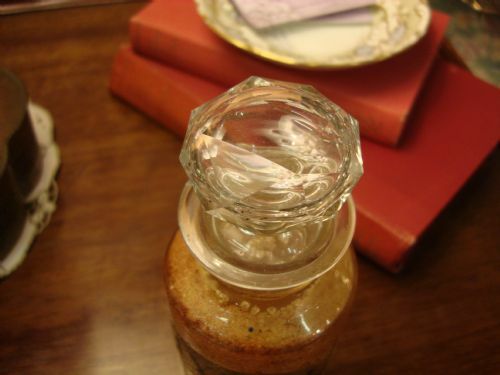 The bottle has a lovely cut glass faceted stopper. Size-8 inches tall by 3 inches diameter. 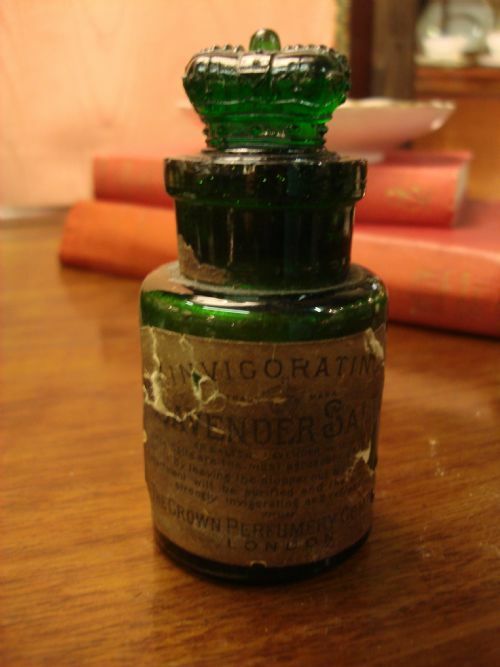 A wonderful apothecary bottle to collect or display, in very good condition. 19th century apothecary jar with painted label. 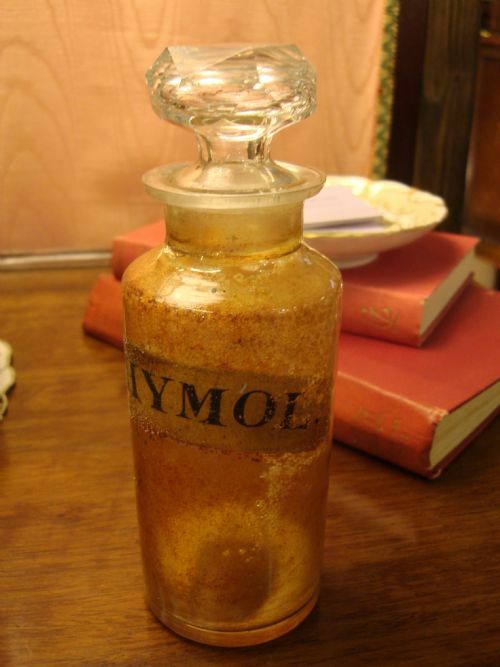 19th century apothecary or chemist jar with a gilt and black painted label and traces to the sides of the original powdered contents, from the large private collection of a retired pharmacist. 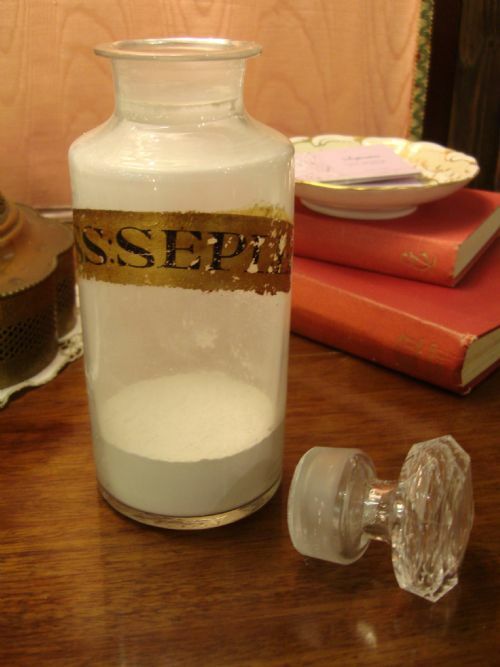 It includes many bottles, laboratory glasses, potions and pastes, an iron cork press or mould, glass cabinet labels, measures and other items. 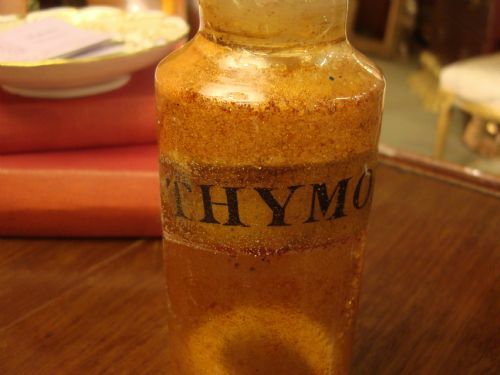 This bottle label is labelled Thymol, which is an antiseptic, good for bacteria and fungi, and comes from the plant thyme. It was even used by the Egyptians for mummification, and is a powerful antioxidant. The stopper is cut glass and faceted. It has not been removed, although I am sure it could be worked loose. Size-6 7/8 inches high by 2 3/8 inches diameter. A great bottle for collections or display in very good condition. Large 19th century apothecary or chemist jar with gilt and black painted label and some original contents, from the large private collection of a retired pharmacist. The collection includes many bottles, laboratory glasses, potions and pastes, an iron cork press or mould, glass cabinet labels, measures and other items. 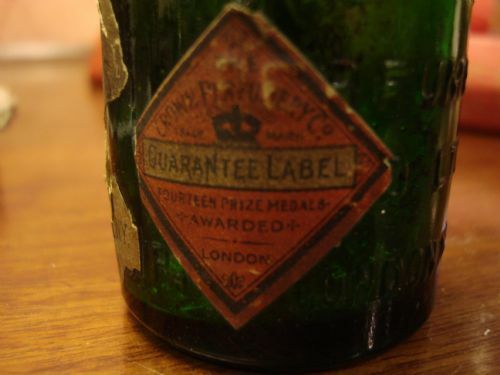 This bottle label is labelled P. Acaciae and includes a small amount of the dried contents. From the acacia tree, this is soluble in water to serve as a protective to inflamed and irritated mucous membranes of the respiratory, and alimentary tracts, as in cases of pharyngitis, laryngitis, dysentery, gastritis, typhoid fever. Also sometimes used as a protective for superficial burns, excoriations, etc. Size-9 inches high by 3 3/8 inches diameter. In very good condition overall with just a smooth chip to stopper edge. 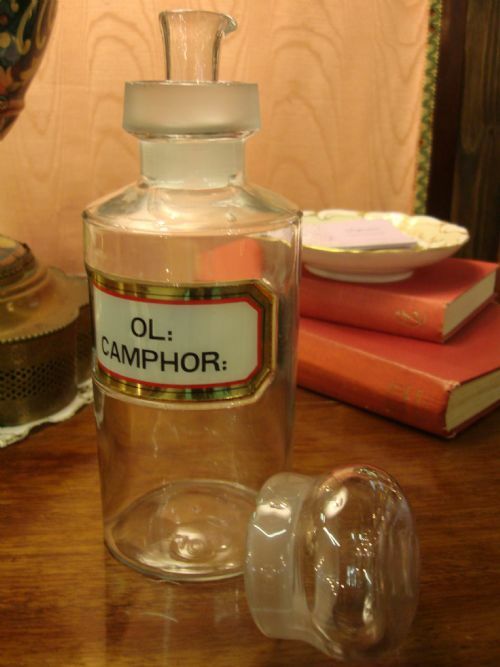 A really nice and large example of an antique apothecary bottle to collect and display. Large 19th century apothecary jar with printed label under glass. Large 19th century apothecary or chemist jar with very nice white, red, black and gold printed label under glass, from the large private collection of a retired pharmacist. The collection includes many bottles, laboratory glasses, potions and pastes, an iron cork press or mould, glass cabinet labels, measures and other items. 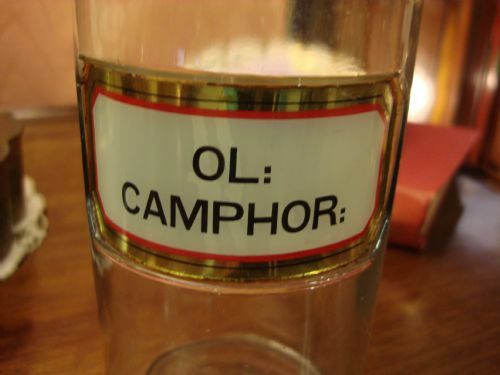 This empty bottle label is labelled OL: Camphor: for camphor oil. 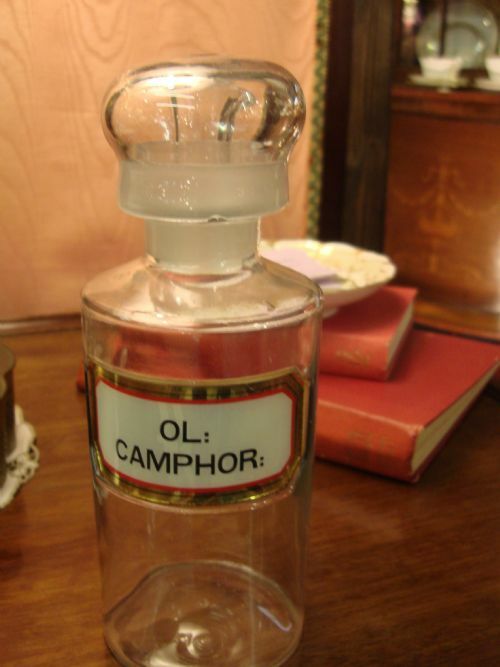 Camphor oil was used in the treatment of nervous depression, acne, inflammation, arthritis, muscular aches and pains, sprains, rheumatism, bronchitis, coughs, colds, fever, flu and infectious diseases. 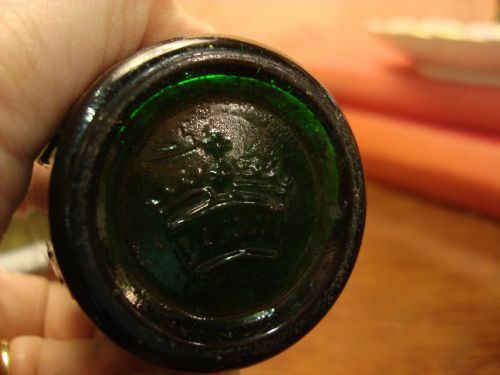 This bottle has both the pouring and exterior dome stoppers. Size-8.5 inches tall by 3 inches diameter. With just a smooth chip to the underside edge of the exterior stopper, this is in very nice condition overall. It will be an asset for collection or display. 19th century apothecary jar with enamel painted label. 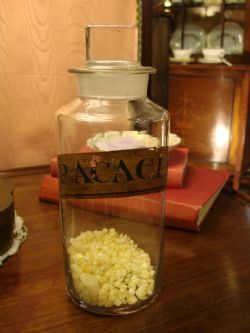 Large 19th century apothecary or chemist jar with a white and gilt enamel painted label and original contents, from the large private collection of a retired pharmacist. The collection includes many bottles, laboratory glasses, potions and pastes, an iron cork press or mould, glass cabinet labels, measures and other items. This bottle label is labelled SPIR. 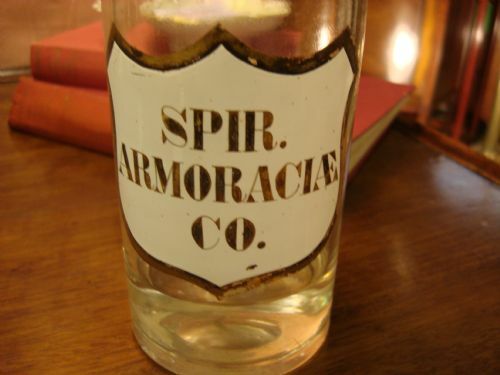 ARMORACIAE CO. for compound spirit of horseradish. 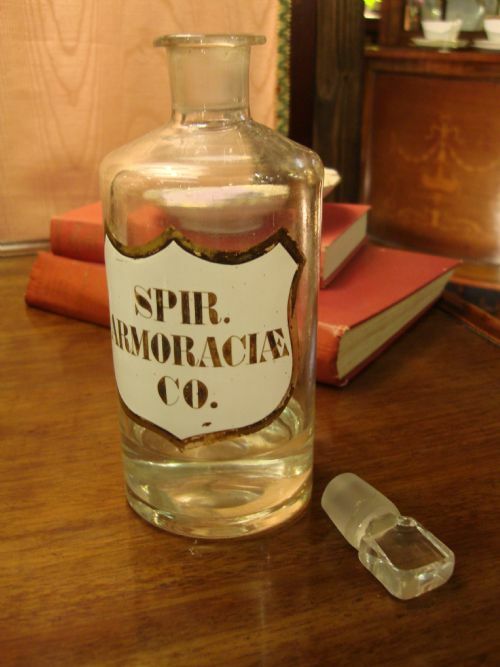 It was used for diuretic remedies, in dropsy attended with debility, especially in the case of drunkards. There is a smooth pontil mark to the bottom. Size-7.75 inches high by 2.75 inches diameter. 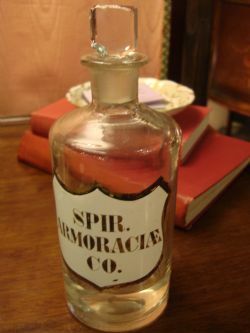 A great apothecary bottle for collection or display, in very good condition, with an interesting history. 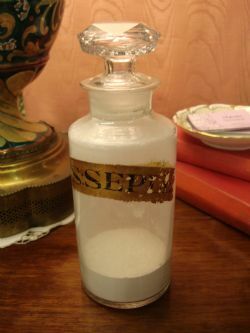 Crown Perfumery green glass crown topped bottle of lavender smelling salts. 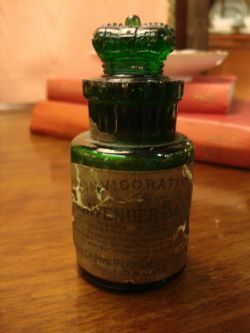 A Crown Perfumery green glass crown topped bottle of lavender smelling salts with original paper labels, and including original contents. In very good original condition with flea bites to top edge. Size-4 inches high by 1 7/8 inches diameter. Part of a large private apothecary collection from a retired chemist. A portion of the collection available is shown in the last photo. 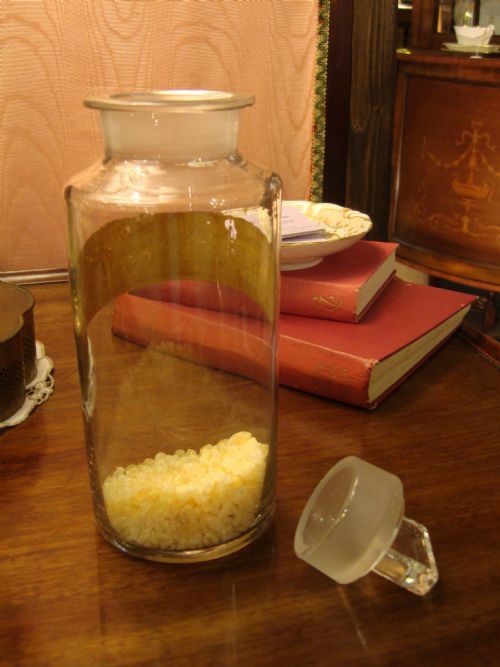 The collection includes bottles, a cork press, beakers, measures, stands, large glass labels, vials and much more.